I have had my Instant Pot for almost 3 years now and I, like then of thousands of others will admit that I am actually in love with an inanimate object and it’s not some school girl crush on a boy kind of love. This is a serious, if I had 1 minute to evacuate my house, besides my dogs and my husband the only other thing I think I would take is my Instant Pot. I know, I know it can be easily replaced but if I was going to be displaced for a number of days I know if I had my IP I would still be able to make quick, delicious and nutritious food. Like this chili which I have been making for 15 + years in a big stock pot on the stove and it took hours to cook. Sigh. Then a few weeks ago I decided I really wanted to have chili for dinner but it was already 6 o’clock and there was no way I was waiting until 8:30pm to eat. What to do, what to do. It literally took me almost tripping over my Instant Pot and knocking myself out to make the light bulb come on. Chili in the pressure cooker. And why I have never tried this before now I honestly don’t know other than I am a bit of a late adopter when it comes to about everything: technology, fashion trends, travel, recipes and small kitchen appliances. So it is, so it will continue to be. The good news is once I sign those adoption papers it is on and when that happens watch out! Even better news, you get to reap the rewards and make this off the charts, so good you will dream about it chili. In less than 60 minutes. It will take you longer to get everything in the pot than it will to actually cook it. To avoid having several different spices on hand I use 3 teaspoons of the Saveur Chili Spice blend in place of the cumin, cayenne, paprika and coruander. Add the chopped onions to the oil and stir to cook until translucent, about 5 minutes. While the onion is cooking, chop the celery and bell pepper. Add to the pot with onion and cook for 3 – 4 minutes, stirring occasionally. Add tomato paste and garlic to vegetables and cook for 30 seconds. Add ground beef and sausage, season with salt and pepper and cook until no longer pink. Toss in the tomatoes with the liquid they are in. Add the beans (make sure to drain). Stir everything making sure the liquid makes it to the bottom of the pot. If there is not a lot of liquid (you can’t see it) add 1/4 to 1/2 cup beef broth. Push the manual button. Make sure the cooker is on the “High” setting and set the timer for 15 minutes. Walk away and relax or do whatever you want to do because you don’t need to give your chili another thought until it’s time to put it in a bowl. Once the Instant Pot is finished, push the Manual/Cancel button to shut it off. At this point you can either wait for the IP to release pressure naturally or if you just can’t wait, manually release the pressure. 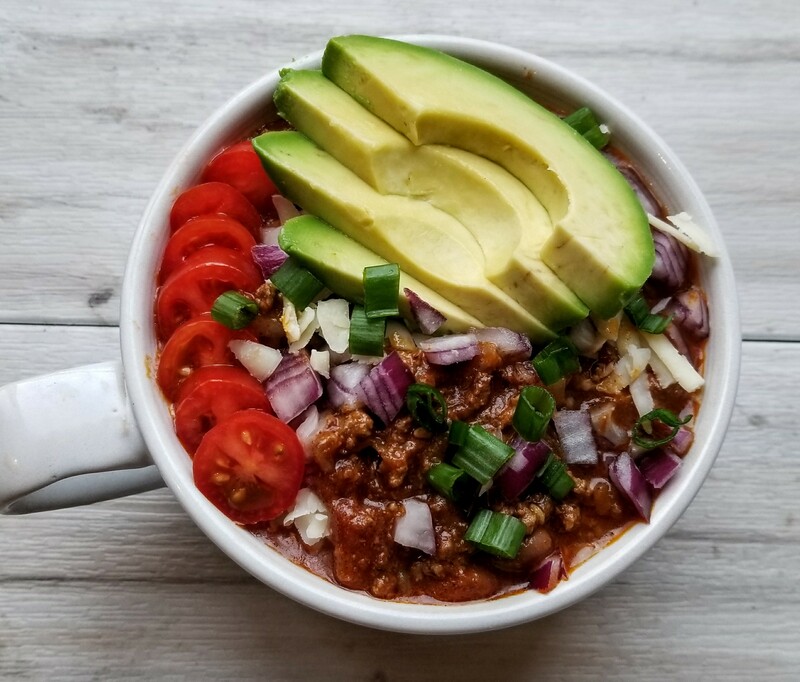 I like to serve my chili with a little good quality cheese, fresh tomatoes, chopped red onion, green onion and avocado.